The Lying Game is played by four 15-year-old girls who are inseparable at an all-girls boarding school. Brought together at Salten House for different reasons, they are all troubled in their own lives and find acceptance and family among each other. Together, they play the lying game. Keeping a tally of points, each girl tells silly lies to their peers and adults alike. They only lie to others, never to each other. The girls become so tightly woven together that they end up isolating themselves from their classmates. No one in the small town believes a word they say. Eventually they find themselves chained to a very big lie that they can’t escape, and they’re removed from school overnight. Once separated they reach adulthood on very different paths. That is, until the three girls receive a three-word text from their friend Kate who remained in Salten. All of them know what the text is about, but no one dares ask Kate about it over text. They all find themselves back in Salten in Kate’s home. It’s clear someone knows too much about their expulsion from Salten House. Once the police are involved they realize what they stand to lose. They only have one choice, keep lying. I felt their excitement, their fear, I was one of the girls. I felt like a fifth in their suspenseful story. Throughout this book I felt physically tense, and I was impressed with the friendship. These girls share a special bond despite the trouble it caused them growing up. I have a scatter of friends myself, but I never had my own “tribe” as they say. It’s hard to maintain a collection of friends who are equally devoted to only each other. Ruth Ware does a great job making the reader care about the girls. We know they’ve done wrong and yet we are on their side. We want to help them. Just when you think you know the truth of what happened and whom is truly responsible, Ware provides another equally probable story line and as a reader we just can’t decide what to believe. Not unlike the girls of Salten. 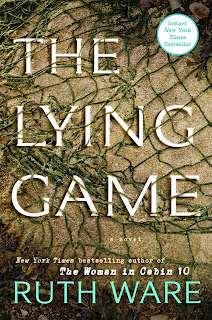 The Lying Game is a must-read. I don’t say that about every book I read, and I read a lot. 😉 I’ve already placed holds on Ruth Ware’s other books from my library. I loved it so much, I may just have to post a separate blog simply to answer the book club questions.